Blogger Introduces New Features. ~ The Blog Doctor. You are here: Home > Twitter > Blogger Introduces New Features. Ever since Beta Blogger debuted last year and then gradually shed off the beta tag, new features have quietly been intruding into the Blogger interface and making their presence felt. Twitter is the new micro blogging tool by which you can keep all your friends anywhere abreast of exactly what you are doing at the moment. Now you can add a Twitter badge to your blog sidebar. Get the code from http://twitter.com/badges/blogger. This will display your Twitter updates in the blog sidebar. Blogger In Draft is not exactly an add-on to Blogger. Instead it is a place for Blogger aficionados to try out the new features in Blogger before they are released fully. You can try out the video upload function which will soon be introduced as a button in the post editor. Also check out the Blogger In Draft blog. Here is an easy way to almost double your feed subscribers overnight. Hope you have already burned your feed at Feedburner and put a subscriber count chicklet in the sidebar. will also be counted. The change in your chicklet number will be evident after 24-48 hours so don't do an immediate check. Another advantage is for users migrating from another blogging platform like Wordpress can redirect their old subscribers to their new feed. New widgets have steadily been added by Blogger to the in-house stable. The latest to be added is the poll widget. Now you do not have to rely on third party sites to add a poll widget to your blog. Add one yourself and introduce interactivity with your readers. Check out the poll widgets at the end of my posts column and right column. Before this Blogger had introduced the Newsreel Widget to automatically add current headlines from Google News to your blog and the Video Bar widget to display clips from YouTube and Google Video for your readers to watch without leaving the page. 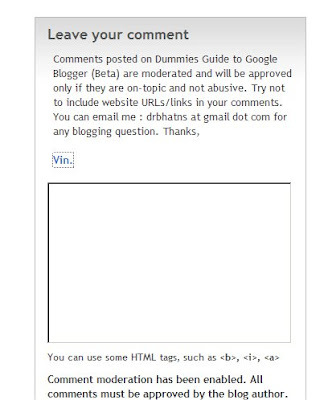 To write one for your blog go to Settings----->Comments------>Comment Form Message---->Type policy in the box and Save Settings. You can add hyperlinks in this box. . Click on 'Comments' link below this post to see my comment policy where I have added a link to my profile. Blogspot blogs do not have facility for you to upload a robots.txt file to the root directory. Hence we have to add a Robots Metatag so that the search spiders know which pages to index in your blog. Google Webmasters Sitemaps has added a robots.txt file in the root of each blog. To see it go to Google Webmasters Sitemaps. Before doing this add your site to Google and verify it with a metatag. At the moment you are not allowed to edit it but I expect this facility to be introduced soon. The Disallow: /search option is to reduce the amount of duplicate content in the blog by refusing the spiders to index the Labels pages. Now you can add as many labels below your posts as you want without worrying about duplicate content. The sitemap option points the spiders to the feed of that blog which contains the latest posts and updates. You can now upload an image in your header directly instead of adding an image element to the header or adding it in the CSS. To center this image make sure to upload an image with the same width as that of the header-wrapper in your template. Thanks for the info on the robots.txt. A few weeks ago, I tried to follow the instructions on the Google Webmasters site on how to create a sitemap, but that was much too complex for me. Hi, Vin, I'm BlogmasterPg , the italian blogger that (sometimes) takes yours post, a summary and, after I pubblish. I think you and The other my american friend, that has a Blog similar to your are the Best teachers about new Blogger. Well; My english is not very well. When I seen in my robot .txt new content I was in panic for some days... I didn't understand what happen! I Think google made me bad on page rank ( but i dind't made nothig), OK, now, I start to understand something ( In my country there are many persons use Blogspot, but nobody know what Google made) When in this post you write: "Now you can add as many labels below your posts as you want without worrying about duplicate content." What do you mean? My fear about duplicate content is why in the past for my principal blog (Now i have ten) BlogmasterPg I subscribe it in many directories and some of these takes my complete feeds and pubblished its.. What do you think? I mistake to do it? Goodbye from Italy; To thank you I made a link in my BlogmasterPg blog, where I have a page only whit some Frieds link. Thank you for all your work. Blogs are full of duplicate content because the label page is the same as the post page which also is same as feed page. Google has a policy against duplicate content and hence it has reduced it in blogs by adding a nofollow to label pages in the robots.txt. So now add as many labels as you want without fear of duplication. Sorry for the silly question but I don't really get it! Would be very grateful if you could explain what putting my feedburner address in the Post Feed Redirect URL will do. Thanks. No problem with above feeds but you cannot customize it (apart from making it short or full) and also you cannot know how many are subscribing to it. When viewers subscribe to your blog they may use any of the original four Blogger feed URLs. On putting the Feedburner Feed URL in the Post Feed Redirect box all your blog feed subscribers get to see your Feedburner feed since all four blogger feeds redirect to it. Hence when you look up stats on the Feedburner feed you see viewers of all four feeds and all of them get a uniform feed from your blog customized as you want it.